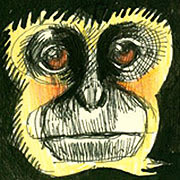 This monkey sketch is from a book my brilliant sister-in-law and brother gave to me for Christmas. I love how wierd monkeys are...and somehow gravitate to them during lulls or no brain time. So, here ia monkey for a snowy day, today. I have been thinking about doing the F. That is, getting the F inbetween the M and the A---through Hartford. Here are the upsides: 1) I finally get a dose of the wonderful Tinkelmans; 2)it's only 2 summers with a year inbetween; 3) I am on a roll now, so why not take the time and see what happens; 4) I will finally get the teachers we were promised at SU and then not delivered on. The downside is more time and more money. The time comes out of the margins...and its a continuation of what is going on now...and the money I can borrow or hope that a certain project I have finally begins to produce some dough. Money is not a big issue...I think I can figure that out. And, if it all dovetails, I think I will start this July--as that is when this particular session begins...and if I don't go now, it would be in 2009 which seems way too far away--and my life at that time will be in the getting kids ready and funded for college. So, to my thinking, its now or not at all. On other fronts, the burkas continue. I did a little blog reading this week about islamic people talking about their perceptions of burkas. It was interesting to read commentary from people who view the burka as a point of extremism. One step too far...almost a fanaticism versus a very conservative commitment to the words of Mohammed about women being kept private. I think there parallels between orthodox and conservative jewish dress and that of islam--and the perceptions from within the community and outside the community. So, I am torn about how I weigh into this discussion except that my hope is that the women that wear burkas make the decision to live this lifestyles on their own. If they do make these decisions--then it is their choice to express their beliefs in a very visual and distinct way within their community. And this decision and lifestyle need to be respected independant of one's personal beliefs. That should get you thinking in a new direction. More tomorrow.